Campbells Vegetable Soup 1953 Ad. This color June, 1953 ad states is your baby ready for growing up food. 4 out of 10 youngsters by their first birthday are eating Campbell Soups. Picture shows baby setting in high Chair eating bowl of Campbells Vegetable Soup. Magazine tear sheet picture is taken through plastic and may show wrinkles or crookedness that is not in the ad. This Original magazine tear sheet measures 8 inches wide by 11 inches tall. 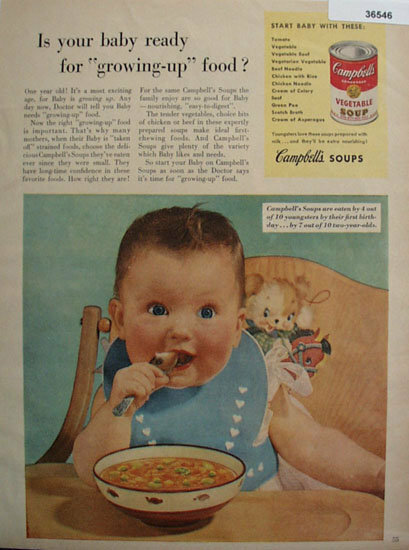 Items Similar To "Campbells Vegetable Soup 1953 Ad"